Come and enjoy a big band jazz session before your Sunday lunch! The cafe is open for the duration for hot and cold drinks. 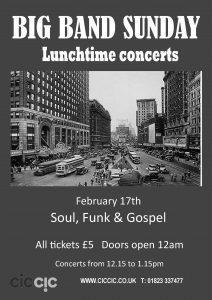 This month’s theme is ‘Soul, Funk and Gospel’ featuring the fabulous Hannah Deason- Barrow on vocals. Each month the Sunday Big Band is aiming to highlight a different style of Big Band music. Without repeating any tunes. Hannah will be singing a couple of Aretha Franklin numbers, ‘Natural Woman’ and ‘Respect’ from the 60’s. Right through to ‘Mercy’ by Duffy from the 2000’s and several more in between. The band will break out the Stevie Wonder, serve up a hot ‘Chicken’ and probably ask you to ‘Pick up the pieces’.